Even Weird Willy Bryant couldn't come up with a positive spin on this. Who'd be a ponzi pimp, Eh ??? All of the nonsense Weird Willy Bryant has regurgitated over the past months, yet My Daily Cash Machine is crashing as fast, if not faster as any ponzi fraud I've seen, just as the truthtellers predicted. A 3000 place drop in less than 24 hours compared to 3 months ago, now THAT'S what I call Weird Willy Bryant reputation ruining. Down and down she goes, where she stops, nobody knows. 24 hours later and we have a drop of 3000 in My Daily Cash Machines' visitor numbers compared to 3 months ago. So, what does Weird Willy Bryant have to say about his beloved My Daily Cash Machines' rapid demise. He's resorted to speaking gibberish again. As far as I can make out, and I'm not fluent in gibberish, Weird Willy has moved into pimping an MDCM cryptocurrency. Is it just me,or does My Daily Cash Machine look like a rapidly failing ponzi scheme to anybody else ???? Not long now until My Daily Cash Machine is no more. It appears the addition of CryptoInvest hasn't helped Weird Willy Bryants' My Daily Cash Machine survive the inevitable ponzi crash and burn. 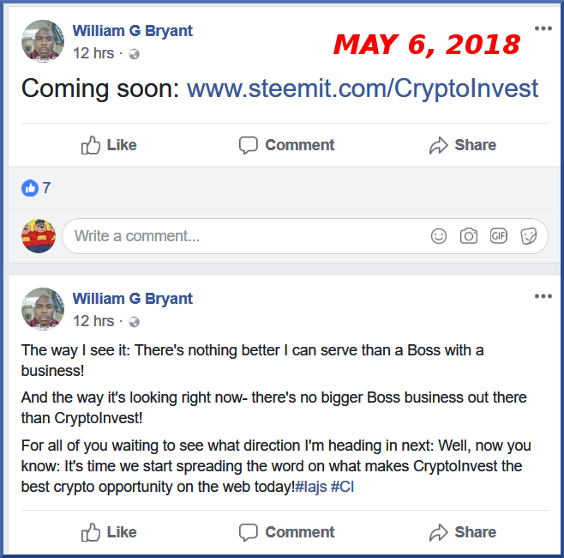 No matter what you call it, "round two" of a post next-big-thing scam scheme NEVER lasts as long as the scheme it follows, even if you have a Weird Willy Bryant pimping the h*** out of it. When they drop 5000 Alexa positions in just over 24 hours, you just KNOW it's all over, bar the shouting. Damn, another 3000 drop in ranking for My Daily Cash Machine in less than 23 hours. 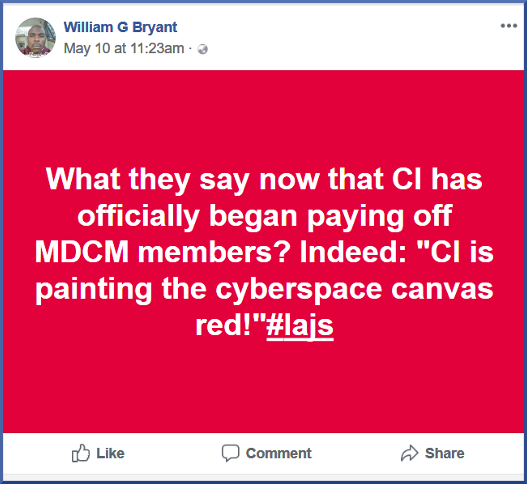 Weird Willy Bryant, for all his proselytizing about how MDCM was going to be "different" has reverted to type. How disappointing. Here we all were thinking Weird Willy was somehow different than your average run-of-the-mill ponzi pimp and he's let us all down. 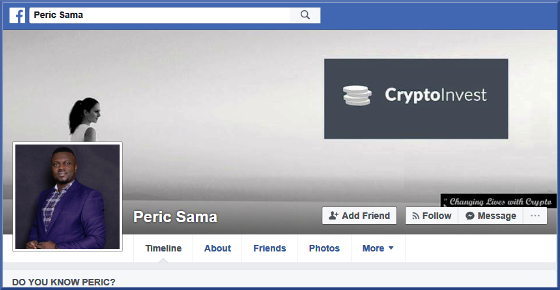 Not only that, he is once again a day late and a dollar short, just like he was piggybacking on the collapsed Traffic Monsoon with his My Daily Cash Machine revshare / adpack scam scheme, he's trying to move into fake cryptocurrency after the collapse of OneCoin, Bitconnect and USI-Tech ruined crypto based HYIPs forever. My Daily Cash Machine Round 2 aka CryptoInvest sure as h*** ain't gonna save the day for Weird Willy Bryant. A couple more days like this and My Daily Cash Machine will be in a vertical freefall. Does this look like the trajectory of a vibrant, thriving business in which you'd be tempted to invest your hard earned ??? I gotta admit, by any measure, the My Daily Cash Machine crash is pretty impressive. Where's Weird Willy Bryant when you need his explanation ??? Another 5000 decline in 24 hours for My Daily Cash Machine. 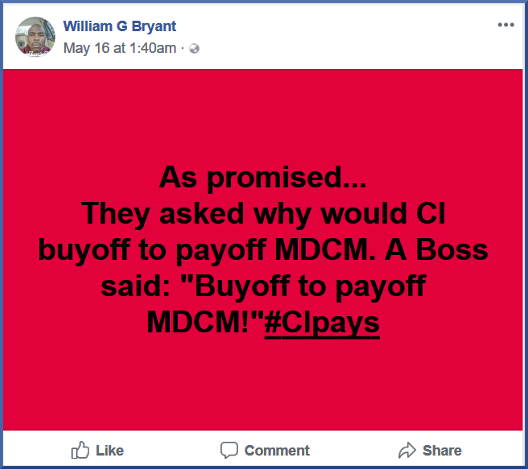 You'd think Weird Willy Bryant would finally admit it was all over bar the shouting for MDCM, wouldn't you ???? Another day, another 5000 drop. 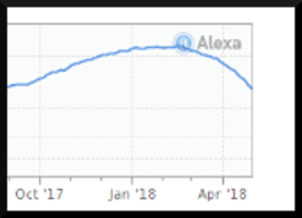 Well, well, another day, another 5000 drop in Alexa ratings. So, does Weird Willy Bryant come clean and admit My Daily Cash Machine is dead in the water ???? Nooooooooooooooooooooooooooooo, not William G Bryant. He's pretending everything is OK and MyDailyCash Machine #2 is now called MDCMCI aka MyDailyCash Machine CryptoInvest is the bees' knees, the ducks' nuts and the ants' pants. 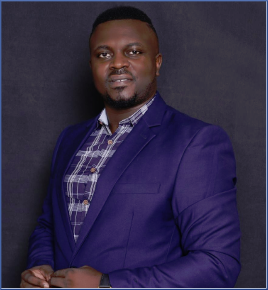 Speaking of "new owners" why does this guy use the term "WE" when talking about the launching of MDCM CI ??? Isn't the new "owner" supposed to be a "she" ??? Another thing - why would someone purchase a ponzi scheme in its' death throes, then offer to clear its' debts, anyway ??? 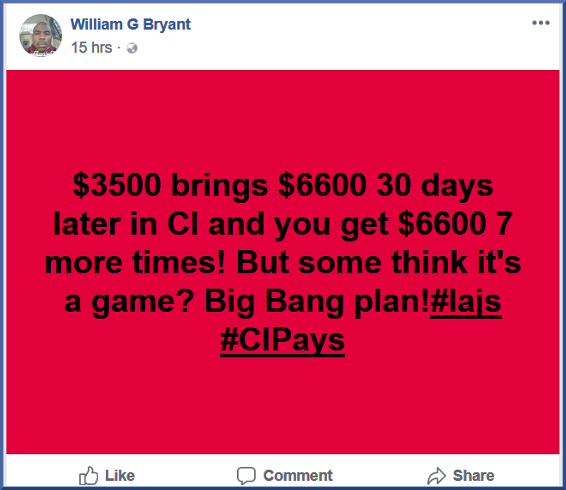 Wouldn't it be cheaper and less hassle to simply launch a new scam scheme WITHOUT the baggage Weird Willy Bryant and My Daily Cash Machine bring ?? ?